1880s autograph album that belonged to Lillie A. Harris of Sherburne, New York. On the page Lillie gave her name as owner, she included the date either March or May 1885; note the blemish over the month, which could be either March abbreviated or May spelled out. An L. A. Harris inscribed two pages in the album. Was this Lillie herself? The sentiments, however, appear to be directed to Lillie from someone else. The album measures approximately 5-1/2" x 3-1/4" and contains the sentiments of about 50 of Lillie's relatives, friends and schoolmates. An alphabetical surname list and an alphabetical list of the signers, together with any personal information they offered, appear at the end of this post. Lillie A. Harris, or Lillian as her daughters' marriage records indicate, was born April 4, 1872 in New York, the daughter of Jacob and Helena Harris, whose Census records indicate they were German immigrants. It would seem that Jacob anglicized his surname, though I'd like to hear from a reader with direct information. About 1897, Lillie married Warren Dewitt Waterman, son of Dewitt C. and Olive (Guthrie) Waterman. Warren was born April 13, 1874 at Madison, New York. Lillie and Warren settled in Oneida County, New York, and raised, I think, eleven children. Lillie died in 1933 and Warren in 1949. Lillie had a sister, Grace F. Harris. She inscribed at least one page in the album, if not two. 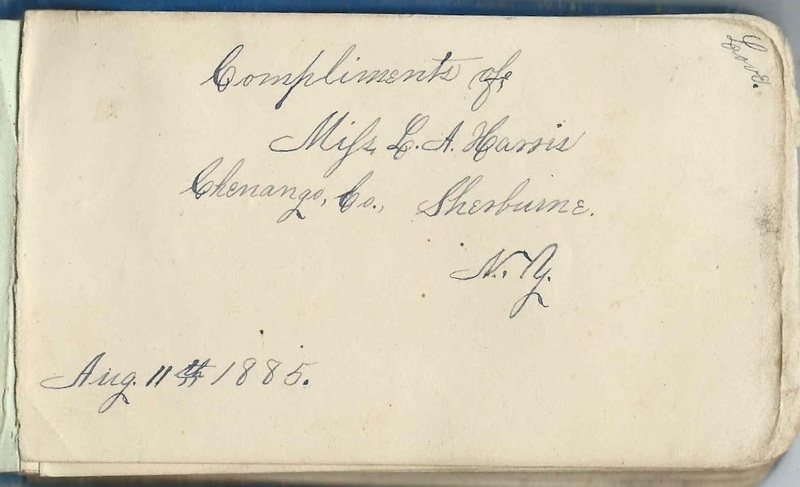 George K. Hawkins inscribed a page at Sherburne, New York, on June 24, 1887. He was the principal at Lillie's school. Teacher Silas Lottridge inscribed a page. Herman Schroder, or Herman Shroder, wrote his sentiment in German. Sarah Barbieri of Sherburne, New York, signed on December 23, 1886. I found a Sarah Barber of the same time frame at Sherburne, New York. I don't know if the family had changed its name or if Sarah was romanticizing her name. Lillie A. Harris of Sherburne, New York, dated March or May 9, 1885. She may have been the L. A. Harris who inscribed two pages in the album. Miss L. A. Harris, signed at Sherburne, New York, on August 16, 1885; perhaps written by the album owner herself but appears to be someone leaving a sentiment for Lillie. Miss L. A. Harris of Sherburne, New York, signed on August 11, 1885; perhaps written by the album owner herself but appears to be someone leaving a sentiment for Lillie. Grace H., signed at Sherburne, New York, on August 5, 1887; presumably Lillie's sister Grace F. Harris. 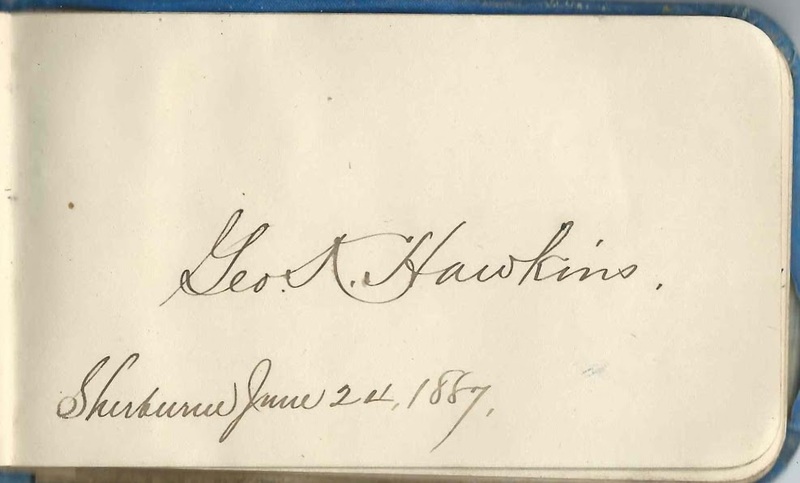 George K. Hawkins, signed at Sherburne, New York, on June 24, 1887; Lillie's principal. Frank Herrick, signed on February 4, possibly 1885; Lillie's schoolmate. He wrote in a very complex script with added designs. Not positive of his surname.